Un programme de field school et de renforcement des capacités sera prochainement organisé par le DURELL Conservation Academy et aura lieu à Madagascar et à Maurice. The course “From Mauritius to Madagascar: building regional capacity for biodiversity conservation and monitoring” is the focus of a new three year Critical Ecosystem Partnership Fund (CEPF) project aiming to increase regional capacity for biodiversity conservation in the Western Indian ocean. Technical skills for fauna/flora monitoring and ecosystem/species recovery will be developed through two separate field school training sessions conducted each year for the next three years: three weeks in Madagascar and five weeks in Mauritius, including one week in a classroom-based setting in each country. This eight week funded course will provide participants with different field-related experiences, together with the theory and human resource management skills needed to become more effective conservation leaders. It is a unique opportunity to learn directly through exchange of skills and understanding with organisations that have a track record of conservation success in the Western Indian Ocean islands. 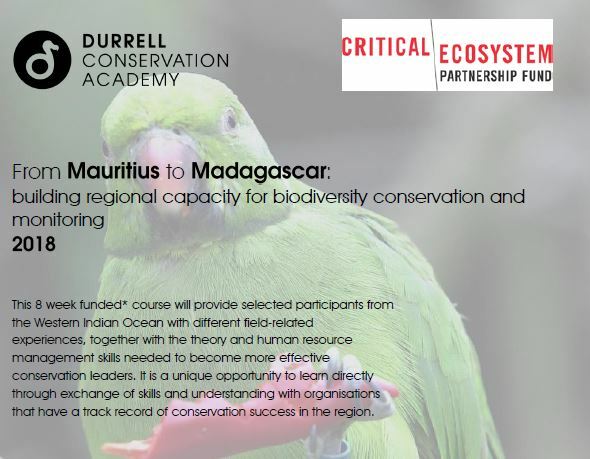 The programme is delivered by Durrell Conservation Academy, headquartered in Jersey, and Durrell Conservation Training Ltd (DCT) a not-for-profit training organisation based in Mauritius (part of Durrell Wildlife Conservation Trust) in partnership with the Critical Ecosystem Partnership Fund (CEPF), Mauritian Wildlife Foundation (MWF) and Association Vahatra. Two individuals per cohort will be selected after each eight week course for a place on the following 6 month Post Graduate Diploma in Endangered Species Conservation Management, delivered annually in Mauritius by Durrell Conservation Training Ltd. Please outline what you hope to gain from the course and include two letters of reference. PS: Veuillez lire attentivement les pièces jointes associées à l’admissibilité des demandeurs et le processus de demande. Suivant Tampolo, première aventure pour les amoureux de la nature !